TreeHelp.com notes that about 35 separate species of pines grow native to North America, with other ornamental species introduced for use in landscaping. Pine tree identification hinges on your ability to look at all the aspects of a pine tree and categorize it from the data you accumulate. Take into account such facets of a pine as its needles, its size, the cones and its bark, and you will get a good idea of what type of pine it is. Approximate the height of the pine tree, remembering that different species grow to varied heights. Smaller pines include the Virginia pine at a maximum of 40 feet. Intermediate pines such as the pond pine can be 70 feet tall. Giant pines, usually found in the western part of the continent, include species such as the 200-foot tall sugar pine tree. Add up the number of needles growing in bundles on a pine tree you investigate. The needles are one of the keys to pine recognition, as each species typically will have its needles growing in a certain number from the branches. Slash pine, for example, has needles that grow in bundles of twos. Knobcone pine needles exist in bundles of threes. Measure the length of pine needles when you attempt to identify one tree from another. 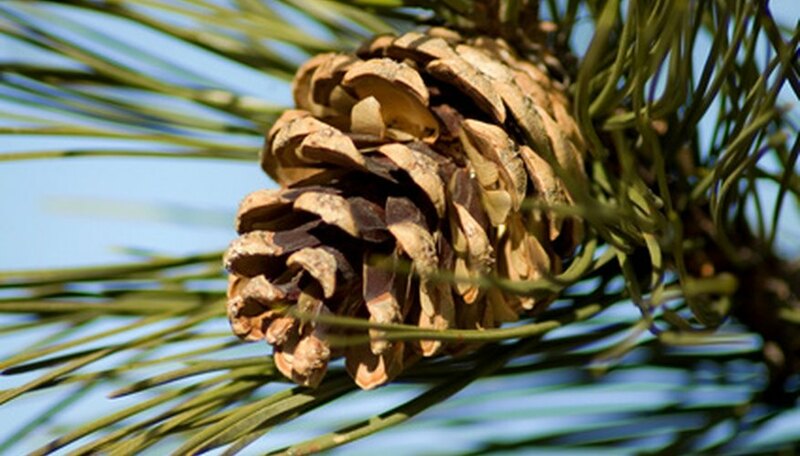 The pine species have needles that grow between certain parameters, such as the 5- to 10-inch range for ponderosa pine. Some pines have short needles such as the 3-inch needles of sand pine, while others have longer needles. Gauge the elasticity of the needles as well. Some pines have stiff needles, such as slash pine; others such as the white pine are noticeably flexible. Examine the pine cones, looking at their length and overall appearance. Inspect the cone closely and use the information you gather about it to help identify the species. Take the cone of the pitch pine. The cone is from 2 to 3.5 inches long and has a bristle on each individual scale. The cones grow on the branch in clusters, with as many as five in one group. The cones are compact and can stay on the tree for years before falling off. Look at the bark of the pine tree. Consider its color and texture as you use it to help you identify the species. You would be able to identify ponderosa pine from its orange-red bark that exists in scaly plates. The bark of lodgepole pine is almost black or colored like straw. Eastern white pine possesses bark that forms in small plates shaped like rectangles.